When you book a Nerf package, you have the option of choosing the classic Nerf N-Strike Elite blasters and bows OR the new Rival Series. 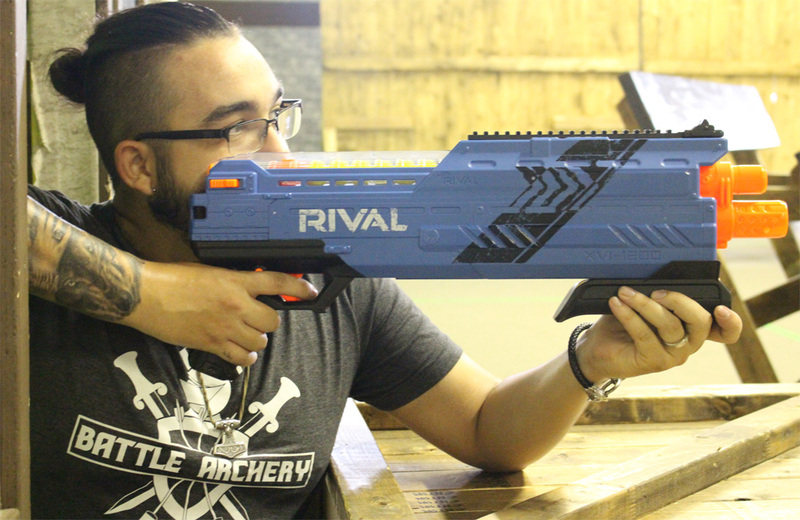 Nerf Speedball at Battle Archery uses the Rival series guns and they definitely pack quite a punch compared to the N-Strike! That’s why you need to be older to use them! The Rival series uses a new projectile bullet that is in the shape of a yellow ball. This allows the guns to almost never jam and are very similar to airsoft & paintball but without the pain and mess. New game modes like capture the flag and werewolf. 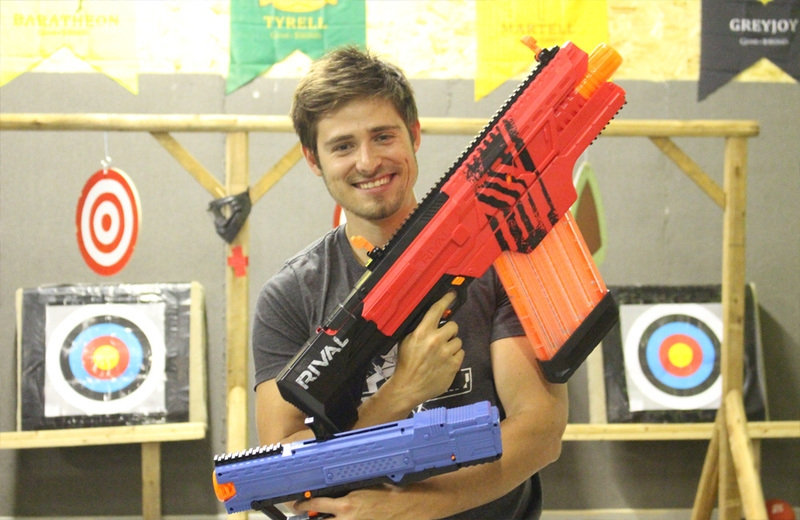 If you want to try something new, make sure to book a Nerf session with us! When booking a Nerf Speedball party package, you will be reserving the battle arena full of castle walls, medieval obstacles, catapults and more. This package comes with all the gear included. Our Nerf Rival arsenal consists of Shotguns, Pump action blasters and Sniper guns – these guns might not be suitable for some of our younger players, but don’t worry, you can always switch up to the Nerf N-Strike blasters! The FPS of the Rival series guns is higher and so the bullets hit much harder. Imagine paintball without the pain and mess! 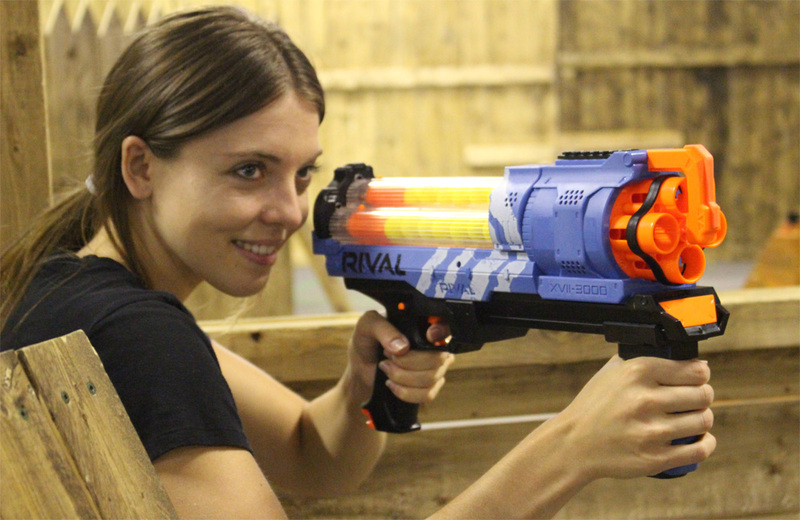 We are the GTA’s biggest Nerf Arena – the facility is approximately 12 000 SF, and boast only the newest Nerf Rival series guns. Want to double up on game time at a better rate? A second hour of fun is discounted, so how about mixing and matching experiences! Make your birthday a mix of Archery and Nerf – call our front desk for more details. No messy clean up, and you won’t have to worry about finding the bullets under your furniture WAY after the guests have already left! Now you’re left with the decision to either play Battle Archery, or Nerf Wars! Why not book both? Make your party epic! Incredible. Everyone seemed to have a great night. I came in hesitant on how this could be better than laser tag or dodgeball and I was happily surprised. Will go back, will bring friends. If you’re looking for a place to shoot your annoying friend in the head with an arrow, keep reading! First time I went to this place I had a really good time, in a matter of a few weeks they constructed the arena with AMAZING obstacles and brand new game plays, and they are continueing to evolve. Really CHEAP compared to other archery tags and one of the most amazing employees. They provided table tennis, fuseball, super smash brothers and other games to just chill! Can’t wait to go again. Amazing place! Great competitive atmosphere. Our referee/instructor was very friendly and did a great job managing all of our personalities. smile emoticon He was super smiling and genuine the entire time. Thank you for putting up with us! Tip: Wear clothes that are breathable. You sweat a lot! Took 10 boys here for a birthday party for our 12 year old. It was AMAZING!! Love how the leader kept mixing it up with new challenges and games. Nice to have the Wii, foosball and ping pong available in the lounge area as well. Definitely coming back. Thanks Battle Archery staff! I took my Scout Troop to battle archery and they had an amazing time. I have taken them to Laser tag, rock climbing and more but they said this was the best activity they have done. Even myself and my other leaders had a blast as we all played. The team there is fantastic they were helpful in explaining everything and monitoring the games. We are definitely going back. JOIN US ON THE BATTLEFIELD! Phone lines open at 12 PM everyday.